If the task of constitutional theory is to set out a language in which the discourse of constitutional law may be grounded, a question of the utmost importance is how this terminology is created, defined and interpreted. 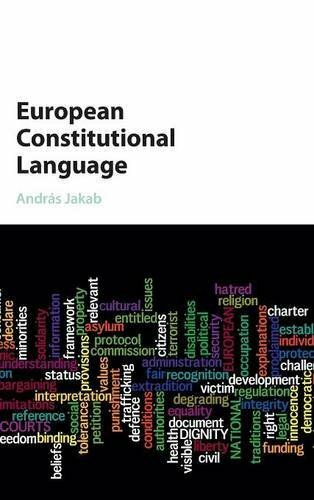 In this groundbreaking new work, András Jakab maps out and analyses the grammar and vocabulary on which the core European traditions of constitutional theory are based. He suggests understanding key constitutional concepts as responses to historical and present day challenges experienced by European societies. Drawing together a great and diverse range of literature, much of which has never before been touched upon by scholarship in the English language, Jakab reconceptualises and argues for a new understanding of European constitutional law discourse. In so doing he shines new light on what constitutes its distinctively European nature. This remarkable book is essential reading for all scholars and students of constitutional theory in Europe and beyond.